Click this map to go to NASA's interactive web map of the 1806 eclipse. On June 16, 1806, a total solar eclipse crossed the North America from Baja California to Massachusetts. This was a long duration eclipse with nearly 5 minutes totality at the point of greatest eclipse. While the western United States was sparsely populated, this eclipse did pass over Ohio, Pennsylvania, New York, Vermont, New Hampshire, Massachusetts, Connecticut, and Rhode Island. Shortly before the eclipse, a remarkable and erudite pamphlet was written by Andrew Newell, an "Inhabitant of Boston'. You can read the entire pamphlet at the blog post Darkness at Noon, 1806 on this website. Someone new to the phenomena of eclipses can read this even today and gain a good and accurate understanding. Andrew Newell was clearly articulate and well informed and did the citizens of Boston a splendid service by publishing this just before the eclipse. The only advice that would be ill-considered today are the recommended techniques for creating a solar filter. But today we have the luxury of modern solar filters created to strict standards and we can't fault him for improvising with smoked glass and the like. "A total eclipse of the Sun is one of the most engaging and uncommon phenomena, which Astronomy ever presents to our view. A central eclipse of the Sun will happen in some part of the earth in the course of every year; but it is but very seldom that a total eclipse is seen at any particular place. We had a favorable opportunity for observing one of these eclipses on Monday last. It was nearly total in this place; the weather was fair and the air serence and clear. A good clock for several days before, was carefully regulated by corresponding altitudes of the Sun; and the observations were taken with a good reflecting telescope, made by Nairne with a magnifying power of 55 times; an assistant noting the clock, and another taking down the observations." And "There were several phenomena attending this eclipse which seem worth of notice. From the beginning to th etime of the greatest obscuration, the color and appearance of the sky were gradually changing from an azure blue to a more dark and dusky color, until it bore the aspect and gloom of night. The degrees of darkness was greater than was expected, while so many of the solar rays were still visible. Mars and Venus shone bright in the west; Sirius was seen in the southeast, and in the zenith Aldebaran appeared bright and sparkling." This eclipse is noteworthy for an unpublished manuscript by James Fenimore Cooper, The Eclipse. The author witnessed the total solar eclipse in Cooperstown, New York. There is another story involving the native American chief Tecumseh and the Eclipse of 1806. The next eclipse widely observed in the young United States was the annular solar eclipse of February 12, 1831. This eclipse was instrumental in a slave uprising led by Nat Turner. He witnessed this eclipse and took it as a sign from God to begin an insurrection against slave holders. This 1831 eclipse was the subject of the earliest known eclipse map in the United States, printed in the American Almanac and Repository of Useful Knowledge. Even without the track of the eclipse, this beautiful map would stand on its own as an excellent early map of the United States. With the eclipse track, this map combines space and time to present a sophisticated guide of the eclipse. Read more about this early eclipse map on the sister website of GreatAmericanEclipse.com, eclipse-maps.com. Just three years later, the total solar eclipse of November 30, 1834 crossed the southeastern United States. Charles Bowen, the publisher of the 1831 map, conveniently engraved the path of the 1834 eclipse on top of the 1831 path. Again, the cartographic execution was excellent and this map is a fine collector's item. The next widely observed and documented total solar eclipse in the United States occurred on July 17, 1860. Illustrated weekly periodical were widely circulated and gave this eclipse wide coverage. 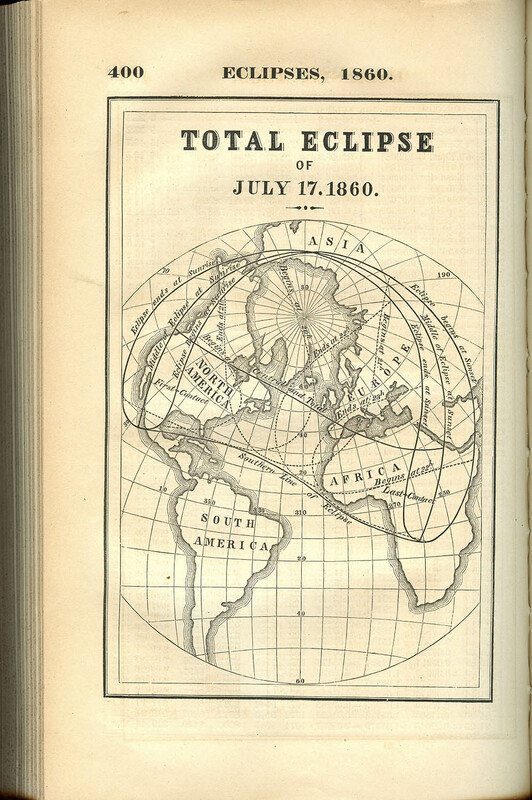 Harper's Weekly and Frank Leslie's Illustrated Newspaper covered this eclipse for the American public as well as the American Ephemeris and Nautical Almanac. The total solar eclipse of August 7, 1869 cut a diagonal across the continent from Alaska to the mid-Atlantic seaboard. From Harper's Weekly of August 28, 1859, "To various points along the line of total eclipse scientific parties went to make observations - some sent by the Government, and some by private enterprises. But the principal point to which the attention of these parties was directed was the corona, observed in previous eclipses, and about which there is much curiosity among astronomers. We now know that the sun is surrounded by an atmosphere of flaming gas, which is the principal source of the light he sends us. This incandescent atmosphere is called by astronomers the sun's photosphere. During a total eclipse of the sun, his whole sphere, including the photosphere, is covered and hid from view by the interposed body of the moon. Nevertheless, at the very crisis of the central eclipses, there is seen a brilliant white corona or halo around the moon's dark body, like that which painters place around the heads of saints. In this corona, moreover, are frequently seen red or rose-colored projections, of irregular form and position, around the disk. The explanation usually given of the white corona is, that it betokens a transparent non-luminous atmosphere, analogous to our own atmosphere. The white light of the corona is accounted for by the reflection of that of the photosphere, very much as our own evening and morning twilight is produced by the reflection of the solar rays in our atmosphere." Total eclipse of the sun drawn by Étienne Léopold Trouvelot. Observed July 29, 1878, at Creston, Wyoming Territory. NYPL Digital Gallery. The total solar eclipse of July 29, 1878 crossed western North America from Alaska to Texas and Louisiana. There were a number of American universities and institutions dispatched to western locations to take advantage of the hoped-for transparent skies in the drier half of the country. The story of this eclipse involves the famous American inventor, Thomas Edison. A principal goal of astronomers at this eclipse was to discern the true nature of the corona. Edison accompanied an expedition to Rawlins, Wyoming and attempted to make a temperature measurement of the corona. The measurement was not a success, but an amusing tale is told in Eclipse Vicissitudes: Thomas Edison and the Chickens. Another telling of this tale is Edison, the Light Bulb and the Eclipse of 1878. The New Year's Day of January 1, 1889 brought a total solar eclipse traversing the western United States from California to the Dakotas. A group of professional and amateur observers were stimulated by the publication of a pamphlet Suggestions for Observing the Total Eclipse of the Sun of January 1, 1889 by Edward Singleton Holden. They organized themselves into a party boarding a train to Cloverdale, California and successfully witnessed and photographed the eclipse. A total of 24 photographers applied their skills and donated their photographic plates to the Lick Observatory. The continuing astronomical interest among the members of this expedition led to the founding of the Astronomical Society of the Pacific soon after the eclipse. The total solar eclipse of May 28, 1900 was widely viewed across the southeastern United States. The key scientific objectives of this era were spectroscopic studies of the corona and the continuing search but ultimately fruitless search for a hypothesized planet inside Mercury's orbit, Vulcan. The Smithsonian Astrophysical Observatory sent an expedition to Wadesboro, North Carolina. The photographs taken at this eclipse were considered to be of very high quality. The path of this eclipse swept a broad arc from New Orleans to Norfolk, Virginia.